'Kim Kardashian and Kanye West are reportedly spending €80,000 on each wedding guest. The superstar couple are set to marry in Paris on May 24 in a lavish ceremony. According to new reports there will be no expense spared when it comes to each of their 200 guests. 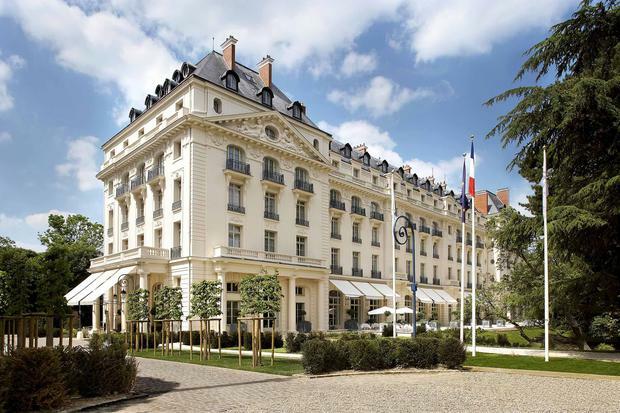 The pair are said to have hired the 199-room Trianon Palace Hotel, minutes away from the Palace of Versailles, with the most expensive suites costing €4,500 a night. "The hotel is very grand, with beautiful views," a source told British magazine Grazia. "Guests will be greeted with goodie bags containing €350 vintage bottles of Bollinger, €140 Crème de la Mer products, handmade souvenir trinkets with Kim and Kanye's initials etched in Swarovski crystals, bottles of scent from local perfumeries and €200 vouchers for treatments at the hotel spa." Kanye, 36, has also hired a fleet of private jets to fly guests to the wedding according to the reports. With only a matter of weeks left until the big day, guests have had their first clue about what to expect at the nuptials as they recently received their €670 invitations. "Kim and Kanye wanted the invites to be as lavish as possible and commissioned a couture designer to create gold silk boxes containing a photo album of their fairytale romance and a silk invite etched in real gold leaf with a clasp of natural pearls," the source continued. The couple chose pearls as they are their nine-month-old daughter North's birthstone. "This is going to be the wedding to end all weddings and Kim wants to ensure that she and Kanye, as well as all their guests, have an experience they will never forget," the source added.